Back pain is a common ailment that affects 50% of pregnant women. The severity can range from mere nuisance level to being a major disability. There are a number of potential causes of back pain during pregnancy that range from loosening of the joints due to the action of certain hormones, to the relatively quick increase in weight that accompanies a developing baby. Back pain during pregnancy can be associated with pain radiating down the leg, commonly referred to as ´sciatica´, and in most cases it can be dealt with effectively, if the right approach is taken. Because the adaptation of the body is considerable during the pregnancy, the unbalance of the pelvis, spine, muscles, often incur back pain, buttock pain, hip pain, pubic pain, and stabbing pain in the abdomen. At Total Body Chiropractic, we establish a treatment strategy that is personalised to each patient. This is because there are a wide variety of factors that can conspire to create pain in the lower back that are unique to pregnancy. These factors must be detected and treated as they affect each individual. Backache or back pain during pregnancy usually commences by the fifth month of pregnancy, when the body undergoes structural changes to accommodate the growing child inside. The pain is usually associated with soreness and stiffness. Although a common occurrence, back pain during pregnancy should be addressed as soon as possible and managed throughout the pregnancy. There could be various reasons for the backache. The changes in the body during the period of pregnancy determine the intensity and the type of back pain in most women. Back pain that occurs because of weight gain depends upon the extent to which the spine can bear the burden. The weight gain during a healthy pregnancy can vary between 10 to 15 kilograms. This weight can strain the back. Pain can also occur due to shift in the centre of gravity and postural changes that cause the back to strain. Two parallel sheets of muscles that run from the rib cage to the pubic bone get separated due to the expanding uterus. This could also cause the backache. Hormonal changes can contribute to the backache. As the body prepares for delivery, it releases a hormone to loosen the muscles and ligaments in the body, which can increase the stress on muscles at the back. Enlargement of breast tissue during pregnancy can increase the strain on the muscles of the neck, shoulders and the thorax region, causing upper backache during pregnancy. Stress is a major factor that could trigger or worsen the back pain that results from other reasons. There are different regions of the back that can be affected during pregnancy. Pain can occur in the waist region in the centre of the back; it is aggravated by maintaining same posture for a long time. Pelvic pain occurs typically below and to the side at the waistline, across the tailbone, in one or both sides. Upper back pain in the thoracic region, usually occurs during the third trimester due to shifting of gravity and postural changes. Maintaining neutral standing and sitting postures and neutral spine while sleeping can help avoid upper and lower back pain. 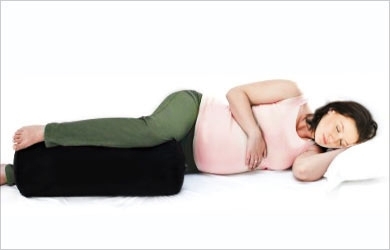 Changing the posture frequently, applying heat and cold to the back, sleeping on the side with a pillow between knees, resting the feet on a higher level while sitting are all techniques to ease the strain on the back. Stretching exercises for shoulders, neck, chest, hips and legs can help keep the muscles toned and strengthen them for bearing the added weight during pregnancy. In general, simple and safe stretching routines can ease the pain, decrease the muscle spasm and lessen the strain on the spine. Aquanatal exercises or gentle exercise in water are also advised. However, it is not advisable to exercise to lose weight, to the point of exhaustion or on an empty stomach.